While I've been a guitar player for over 20 years, I've always had a fascination with other instruments. Over the last few years, I've started branching out and learning others, and today, I can play around 10 to varying degrees of skill level. Some, I have a lot of confidence with, but others not so much. While part of my motivation to play multiple instruments has been curiosity, I tend to practice the ones I feel will allow me to fill a need; it seems like people never need more guitar players, but bass players, drummers or violin players are never around when you need them. Plus, I'd rather let a less-experienced guitar player gain some seasoning while I try to get my reps in on something else. Learning instruments — whether you know one already or not — takes a lot of patience and perseverance, but to me, the experience of connecting with other people through music makes every minute of the work I put into it worth it. Here are two tips I always seem to come back to when I'm learning a new instrument. The importance of setting goals is often said but never truly emphasized. In my ventures, goals are not and should not be abstract. They should be attainable, at least in theory, as well as measurable. A goal such as "I want to be a musician" is abstract because there is an endless amount of ways that technically allow you to reach that goal, but nothing really tangible that you can hang your hat on. On the contrary, saying, "I want to be a musician that makes all my money from music" is something different. You can measure your progress by the amount of dollars coming in and know you've succeeded when you have hit the number that allows you to live the life you want to live. Setting tangible, black and white goals gives you a place to go, whereas abstract goals set you on an aimless path to nowhere. When I pick up any new instrument, I have two immediate goals and one long term goal. The first immediate goal is to figure out what works on that instrument for the accompaniment portion of a song, meaning what to do while someone is singing the verses or choruses. On instruments such as guitar, piano or ukulele, that means learning the chords and applying a rhythm to them. For other instruments, it can be a little different, but the principle remains the same: I have to play something during the accompaniment. What is it? The second immediate goal I set is to get comfortable with the tools for taking a solo. This usually means figuring out how scales are typically played on the instrument, and then practicing moving through them while listening to various song recordings or even chord progressions I make from an online chord generator. The long-term goal I have with any instrument is simple: keep gaining experience doing goals one and two in real-life playing situations. If you want to get good at a particular instrument, playing it as much as possible helps build confidence and experience, the hallmarks of solid players. I think there's a fundamental misunderstanding about music lessons. 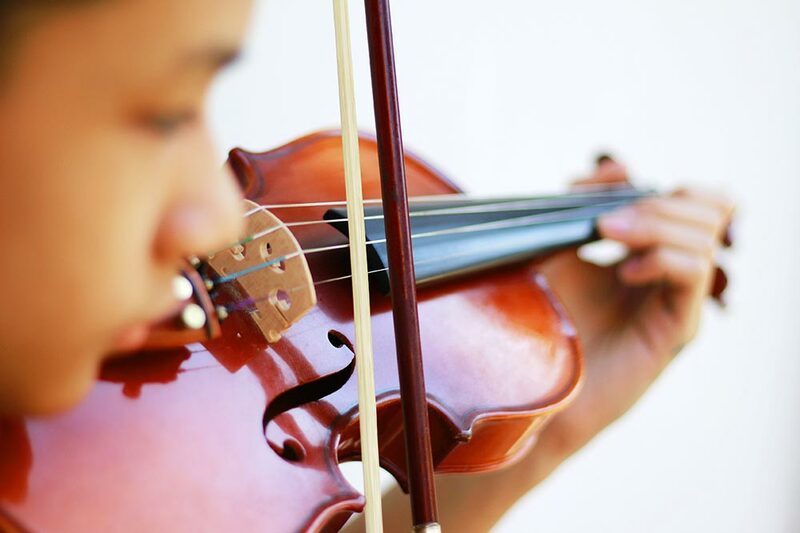 People typically think that they have to take them to learn an instrument, but most of the time, music lessons are actually a complete waste of time and money. This largely has to do with the way traditional music lessons are taught; studies show over 80% of music students quit before the 10th lesson, yet far too many teachers spend the first few years of lessons focusing on technique, instead of on the brute force skills that students need to actually play in real-world situations. As a result, the student (mostly likely the parent of the student) ends up paying hundreds of dollars and gets nothing valuable in return. Now, you might think I'm critical of taking lessons as a whole, but the truth is, I just think they need to be looked at differently. Music is largely a rote skill that requires repetition, and once people gain the knowledge of what they need to repeat, if they're committed to working, they can become quite good without lessons. But, I do pay for music lessons periodically as I need them. Currently, I've gone back to working with a voice coach to iron out some blind spots with my harmony singing. When I started to learn to play the violin, I wanted someone to give me a rundown of how to use the bow because it was such a foreign concept to me. I played piano for a couple years before I took about a month's worth of lessons, and it helped immensely. But the thing is, there's only so much a music teacher teaches you before they start coaching you, and while the difference may seem subtle, they are entirely different things. A teacher shares knowledge you don't have, while a coach cultivates your skill set according to their philosophy. For me, sometimes I need knowledge, and sometimes I need a coach's feedback while I build my confidence. Sometimes I like to consult a pro to simply make sure I'm on the right track with something. When I get my knowledge, I prefer to come back after a month or two of diligently applying it, and maybe, if I felt like I needed to, return for a little correction. The point is that you can still teach yourself and take a lesson here or there to help fill in the blanks. I consider the music teachers I work with not as permanent teachers, but mentors that are available when I need them. And, if they aren't comfortable with that type of arrangement, I simply find someone who is. In turn, I encourage the students who take guitar lessons from me to do the same thing. Music teachers are usually people with a lot of experience, and picking their brains is extremely valuable. I just prefer to think of it as a consultant-client relationship rather than a student-teacher relationship. For more information about taking guitar lessons with us in the Minneapolis and St. Paul area, send us a message.